In a previous post I mentioned the proliferation of crows in Maynooth. It turns out that was a terminological inexactitude, in that the birds in question were actually rooks. It’s true that rooks are part of the crow family (genus Corvus, family Corvidae) which also includes ravens and jackdaws but they do have a distinctive look and character. See the above picture (taken in Maynooth but not by me; picture credit here). With their solemn black coats an’ their serious looks. This refers to the young men studying at the Roman Catholic seminary of St Patrick’s College, of whom there were 500 or so in those days. The seminarians are somewhat fewer in number now, but the rooks are still plentiful. I wouldn’t say that rooks are the most visually attractive birds, and they do have a slightly sinister aspect, but they are very characterful creatures and I find them very amusing to watch. They’re very sociable and tend to go about their business in large groups, especially when scouring pieces of open land for insects and other things to eat. They also seem to tolerate the presence of their cousins the jackdaws (of which there are also quite a few in Maynooth, though not as many as the rooks). Jackdaws are a bit smaller, prettier, and neater in appearance than rooks (which often look very scruffy indeed). I imagine that the jackdaws look down on the rooks rather snootily, as one might one’s less sophisticated relatives. The collective noun for rooks is a `Parliament’, which also suggests that they are not held in very high regard. Like jackdaws, rooks have two modes of locomotion along the ground: a sort of strutting walk and a two-legged hop, both of which are rather comical. Their walk makes them look like officious constables, whereas the hop is more like a child pretending to be a horse. The rooks are basically scavengers and they have a penchant for systematically emptying litter bins in their quest for scraps of food. At the rear of the apartment block in which I live there is a place for storing rubbish for collection in large dumpsters. Sometimes somebody forgets to close the lid with the inevitable result that a large group of rooks gets inside and strews garbage all over the place. When they’re not patrolling around or rooting through rubbish they tend just to sit there watching the world go by, waiting for another opportunity for mischief. 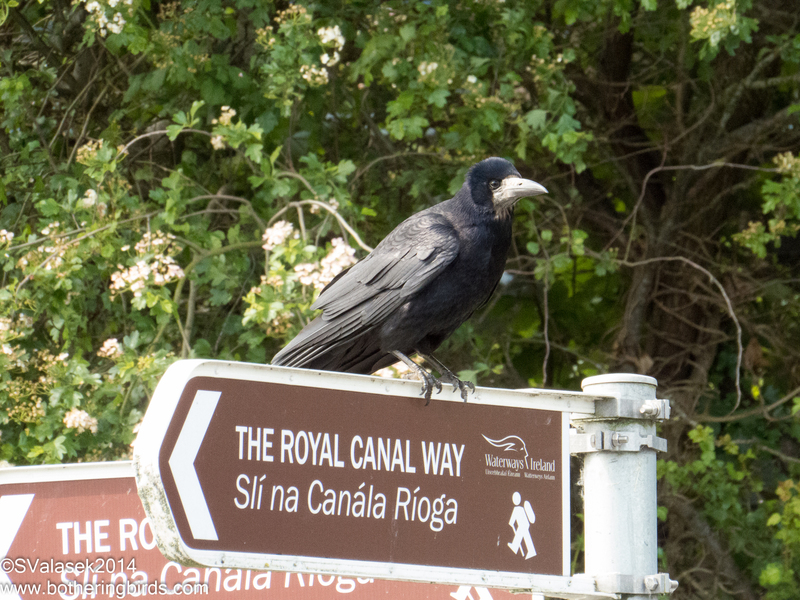 I’m told that, in the old days, the rooks of Maynooth used to gather at the Old Mill, but since that was demolished to make way for a shopping centre they seem mostly to congregate on the playing fields on or near the Royal Canal. Anyway, I’ve got used to them in the short time I’ve been in Maynooth and I always look out for them when I’m walking around. What prompted me to write this post is that on my way to the Department yesterday morning I came across a dead rook lying on the path. It looked like it had died only recently, as there was no sign of decay. It was well away from the road, so it seemed unlikely it had been hit by a car. I suppose it just died of natural causes. This entry was posted on August 3, 2018 at 2:40 pm and is filed under Maynooth with tags Corvidae, Corvus, jackdaws, Maynooth, Rooks. You can follow any responses to this entry through the RSS 2.0 feed. You can leave a response, or trackback from your own site.